It actually went better than expected! I’ll admit: I was late to the game when it came to kombucha. On top of that, I hadn’t done too much research on it prior to trying it for the first time, and let me tell you, when a chunk of scoby (read: symbiotic culture of bacteria and yeast) hit my lips, I had a mini heart attack. Thank god for my kombucha-educated coworkers; upon seeing the...uh...surprised...look on my face, they were quick to explain what I had just experienced. A few Google searches later and I was at peace with scoby, happily sipping away at the rest of my ginger-flavored kombucha. Over the next few weeks I became addicted to kombucha, purchasing one pretty much every single day on my way home from work, justifying the daily purchase by telling myself that it was all in the name of health, since kombucha is said to be a digestive aid. Then 2017 hit, and as I promised myself that I needed to cut down on unnecessary spending, I realized this meant cutting out my daily ’buch (sigh). Then I had an idea: why didn’t I just make my own? Seemed simple enough, and not only that, but home-brewed kombucha was bound to have less sugar than the store-bought versions. This is exactly how I found myself happily walking home a few weeks ago, Kombucha Brooklyn basic starter kit in tow. To say the process was easy would be an understatement. I breezed through the kombucha prep, which involved brewing and steeping two cups of tea, adding sugar, mixing in four cups of cooled water, and then dropping in the inevitable scoby. The claim is that your kombucha will finish fermenting in 10-14 days, and over the next few weeks I watched the scoby grow and change shape. Note that as the kombucha ferments, the scoby will bubble and transform (color included) in weird ways that may be off-putting, but it’s natural and meant to happen. As long as your brew stays between 72 and 80°F (which I monitored with a temperature strip stuck to the side of the glass jar), you should be good to go. A new baby scoby began to grow across the surface of my kombucha around the fifth day, and by the fourteenth day, when I was ready to bottle my brew, it had taken over the entire surface of the jar and was about a centimeter thick. I carefully removed both it and the original scoby using clean hands, and placed the newest scoby in a glass container (along with ¾ of a cup of my finished kombucha) so that I could reuse it at a later date—the original scoby went in the garbage. I bottled my kombucha in glass juice bottles that I had at home and can happily say that I was more than pleased with the outcome of my brew. It doesn’t have as much full-on flavor as store-bought kombucha does, but I am 100 percent okay with that and think that it tastes really good, perhaps even better than what I was originally purchasing. 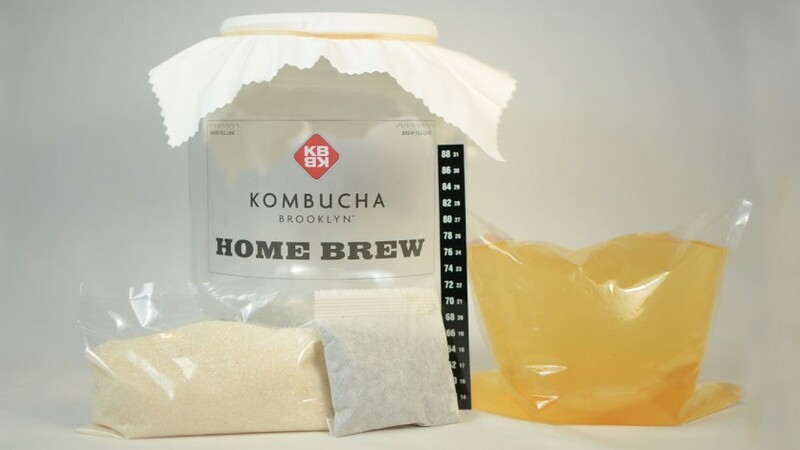 I urge you all to try it out for yourself, either with the Kombucha Brooklyn kit or by purchasing a scoby online and DIY-ing the rest. Happy brewing! 1. Boil 2 cups of water in a pot over the stove. Once boiled, add 6 grams of your tea of choice into the water either in a tea bag or infuser and allow to steep for 20 minutes. 2. Remove the tea bag or infuser and pour the sugar into the pot, mixing well until dissolved. 3. Add 4 cups of cooled water to the mix, keeping everything in the same original pot. 4. Attach your temperature strip to the outside of your glass jar, and pour your cooled tea into the jar. 5. Make note of the temperature, and once it is below 90°F, add the contents of your scoby package (liquid included) into the jar. 6. Cover the jar with your piece of cotton, keeping it in place with an elastic band. 7. 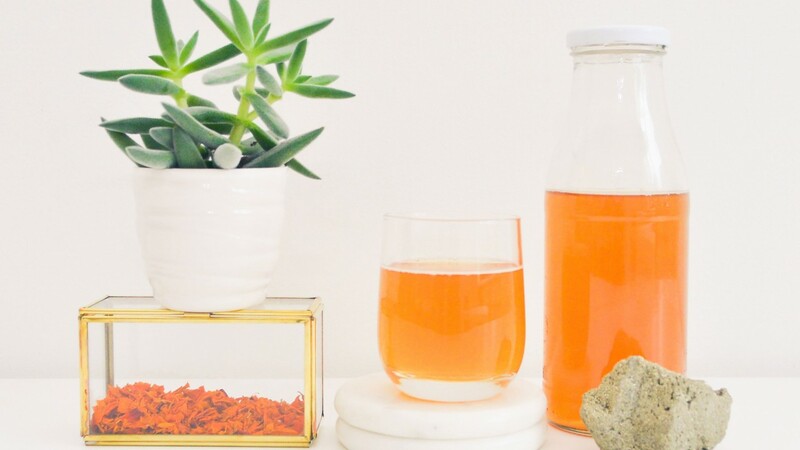 Your kombucha will be ready in 10-14 days, but be sure to sip your brew throughout the fermentation process in case you are happy with the taste prior to the 10-day mark. 8. Once you are pleased with the taste, remove the original scoby from the jar and discard it. 9. With clean hands, carefully remove the new scoby from the jar and place it in a container with ¾ cup of your finished kombucha, keeping it refrigerated until you are ready to start your next batch. 10. Pour the remaining kombucha into your bottles of choice and enjoy! At this time you may add any flavorings that you wish (think: ginger, blueberries and cinnamon, raisins, etc. ).